For the children playing at Choo Choo Park on the corner of Belvedere and Cleveland road in Claremont, the train is something which captures the imagination. It’s large, red, and provides full steam ahead to all the wonderful places that exist in their minds. It may have looked a bit scruffy in the past but last year it was lovingly restored by the Friends of Choo Choo Park who thought the iconic engine deserved a makeover to make her look all shiny and new. Surrounding businesses pitched in too. The group were helped by ProPaint and the the paint was donated by Stoncor. Generous donations were also given by Belvedere Square management and Cal’cacchio a pizza restaurant situated in Belvedere Square, according to local newspaper, The People’s Post. While the makeover has made the train look like it’s just come from a show room, what few people realise is that the train itself is steeped in history and is currently at least 121 years old! The locomotive was actually built by the Brooks Locomotive and Machinery Co in New York, USA in 1894/1896 (sources differ on the year) and was given a works number of 2725. According to one blog which features stories about old steam locomotives dotted around South Africa, Belvedere’s train started service life at the Transvaal & Delgoa Bay Collieries Ltd near Witbank. 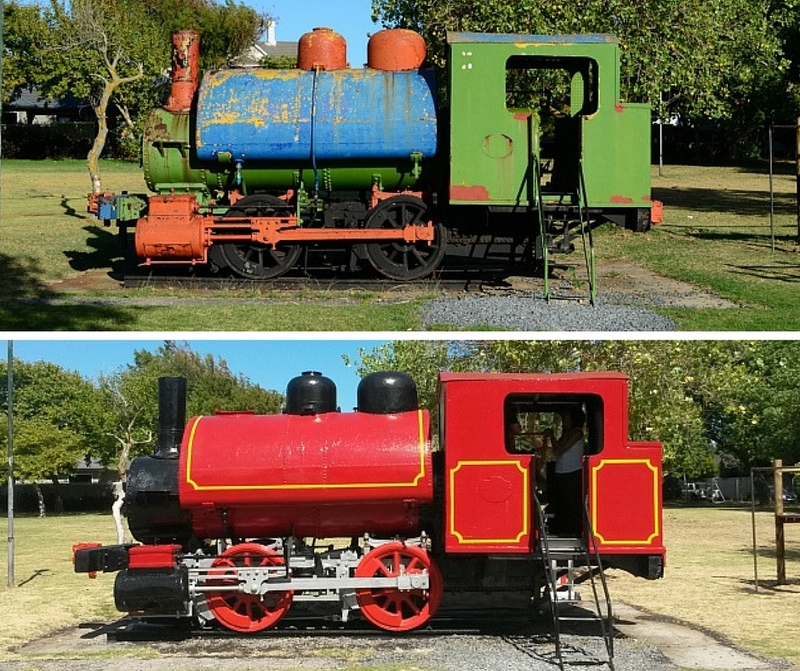 Choo Choo Park’s train is not the only one of its kind in Cape Town – there’s another one plinthed in Intaka Island in Century City. Claremont’s iconic train has worked hard. During the course of its life the train became the property of the City of Cape Town Corporation (City Council) and used as a shunter at the Dock Road and the Table Bay power stations at the Cape Town foreshore and was referred to as “Dyna-Mo” or “Dinah-Mo” – again sources differ on the name. Shunter locomotives are typically used for manoeuvring coaches rather than for making journeys but the work is onerous nevertheless. The original Dock Road Power station was finally demolished in 1961/1962 according to Neville but Dinah-Mo was still being operated on a standby basis at the power station and was believed to be the oldest steam loco still in service anywhere in the country. There’s no doubt that Dinah-Mo had a colourful life (both literally and figuratively). Older pictures show the locomotive sporting several colours including blue, red and green. Our photos provided by the Friends of Choo Choo Park shows that it started to look lacklustre after being exposed to the elements. However, since its revival it now sits proudly in the park painted mainly ‘fire-engine’ red with a bit of yellow and black. “Originally, during her operational life she had been painted dark maroon and, when sounded, her whistle was a high pitched peep-peep,” says Neville. With such love and passion from the community and surrounds, there’s no doubt that Dyna-Mo will live a long life in the heart of Choo Choo Park giving ‘rides’ to children and capturing imaginations from days gone by. While Dyna-Mo may not be working hard right now we’re sure he’s enjoying giving all the kids a lift to whichever fantastic destinations they conjure up. *Article written by Andre Ter Morshuizen from Norgarb Properties. Photos courtesy of Ryan Matthews from The Friends of the Choo Choo Park, Angelique Ruzicka and Lew Norgarb.